It’s a scenic flight from San Diego to Reno, with ocean views to the western horizon on the port side. Once north of LA, Yosemite, Lake Tahoe and the southern tip of the Sierras glide by 30,000 feet below. 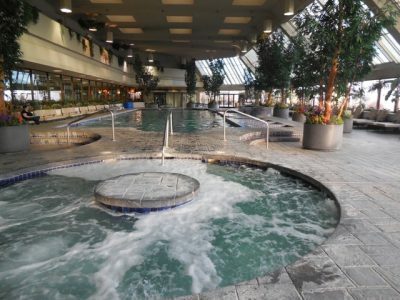 My stay at the Nugget Casino Resort in Sparks, immediately east of Reno, was dedicated to wandering around the area, in order to add a chapter to my Insiders Guide to Reno travel app. Check-in went smoothly and the newly renovated room provided a super view of the Sierra Nevada Mountains. My first stop was lunch at the Nugget’s classic diner, Rosie’s Cafe. An unexpected delight was the indoor/atrium swimming pool (I’m a lap swimmer), in a tropical-like setting, with panoramic wall-to-ceiling windows facing the mountains. Dinner at John’s Oyster Bar featured a superior, everything-out-of-its-shell “Lazyman’s” Cioppino (at $16.95, it’s a bargain). The poker room is well run with lots of regulars playing (always a good sign). There are two daily hold ‘em tournaments at the Nugget. The morning game has an interesting “shootout” structure: no re-buys and a timer goes off after one hour of play. Then one more hand is dealt and, after that, the players with the biggest chip stacks win a share of the prize pool. As you might imagine, the last deal has a lot of betting strategy involved (think the gameshow, Jeopardy). The evening game has standard rules: rebuys are OK, blinds go up every 15 minutes, cash bounties for knock-outs, etc. I had a good run one night and, although short stacked, a pair of Jacks all-in helped me to eventually cash out #1 in the event. Each morning I started at Rosie’s carry-out counter, ordering a freshly baked pastry and coffee. Lunch time found me at either the Noodle Hut and Sushi Bar (don’t miss the duck) or the Buffet with its vast array of food choices. After my tournament win, I celebrated at Gilley’s with a slab of ribs, beer, great music and, yes, a line dancing lesson. It’s raucous fun. One afternoon, I walked over to Victorian Square, a redevelopment area contiguous to the Nugget. There are bars, restaurants, a 14 screen movie theater, the Sparks Memorial Park and Heritage Museum. It’s also where the world famous Hot August Nights and Best in the West Nugget Rib Cook-Off are held. Another outing was to The Outlets at Sparks to visit Scheels, www.Scheels.com, the largest all-sports store in the world. There are over 85 specialty departments, a restaurant and fudge shop, two 16,000 gallon aquariums, an indoor Ferris Wheel and lots more. Whether you are looking for arts, nightlife, gaming, music, events or outdoor activities, there’s lots going on in the Reno/Sparks area. 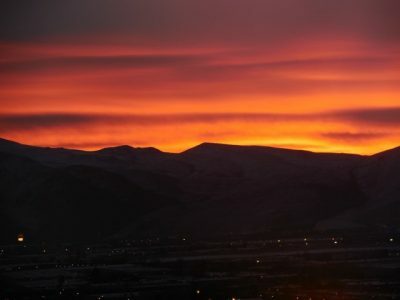 For more, go to www.VisitRenoTahoe.com. For reservations/information, logon to www.NuggetCasinoResort.com. There is a resort fee that provides Wi-Fi, shuttle service to/from the airport, daily bottled water, parking and access to the health club. Note: I’m going back to visit Circus Circus in Reno with my grandson for a new travel story and app chapter, Reno for Kids. Stayed tuned. My Poker Tutorial: Omaha 101 Plus An Insiders Guide To Reno won Gold in the app category in the North American Travel Journalist Association’s 2015 competition. It can be found in the iTunes store.